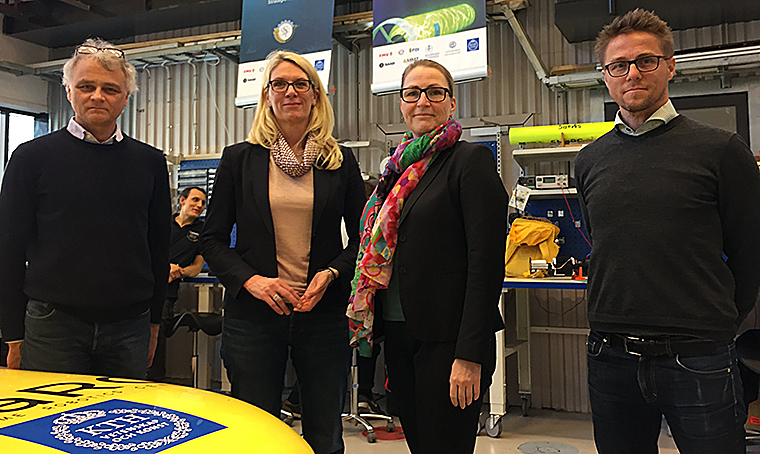 Helen Ågren, Sweden’s Ambassador for the Ocean at the Ministry of Foreign Affairs, visited SMaRC on April 2, 2019. The Ambassador was given a review of ongoing projects by the SMaRC representatives and a visit in SMaRC’s laboratory at KTH. She also presented the government’s priorities in the coming years. – It is exciting to see all the uses for this amazing technology, said Ambassador Helen Ågren. There are also interesting connections between SMaRC and the upcoming UN Sea Conference in Portugal in 2020, which focuses on science, technology and innovations. SMaRC has long had good contact with underwater research in Portugal and especially the University of Porto in Portugal, which has a world leading position in underwater robotics. Prof. João Sousa at the university is part of the SMaRC’s Scientific Advisory Board.